King Of Woolworths (great name by the way) is really the work of one man Jon Brookes who wrote, produced and engineered the album. It's a work of exceptional electronica with many special guests and delightful surprises from all involved. "G-Plan" could almost be the theme music for an espionage thriller from the 60s or the 70s. It's inviting gentle percussion and xylaphone synth effects lead seamlessly into a thumping bass line. The funky feel and cinematic them is very alluring. This instrumental gem has some weird and wonderful synthesiser moments but is still extremely accessible and familiar. The dreamy, floaty dulcet tones of Dot Allison is the best thing to recommend "Sell Me Back My Soul". Not unlike Dido, Dot Allison has one of those voices which can transform an average song into something rather special. You can shut your eyes, listen, lie back and just gently drift off. It has that blissful relaxing effect on you. More immediate, jaunty and offbeat is "123 (Brillas Beat)" with the playfulness of Daft Punk and mischief of Space Raiders mixed with the multi-layered textured expansiveness of Air. "Nuada" is more of a conventional pop song than experimental electronica with Emma Pollock providing an arresting sultry performance. The production is faultless and the overall impression is of a less poppier Saint Etienne, not surprising since Bob Stanley guests on another track on the album. 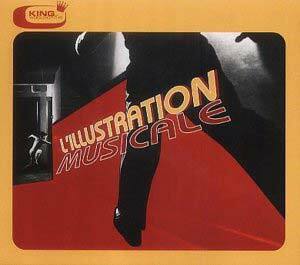 "L'Illustration Musicale" is a filmic, mesmerising, mellow, chilled, atmospheric and original piece of work. It has influences as diverse as Tangerine Dream and the lack of pretension is simply refreshing. Even if you're not that keen on what's commonly known as electronica, you'll still recognise good tunes and interesting ideas on this album from King Of Woolworths.